Saturday morning I had breakfast with an old friend that I’ve known for most of my life. It’s been a few months since we last spoke, so we took the opportunity to get together for a few hours to catch-up on stuff. My friend is a bass player and doesn’t play live that much anymore, but he continues to record as often as possible. I won’t get into his music credits in order to maintain his privacy, but he’s a respected musician in many circles. It’s really cool, as we have been in contact for over 40 years now. I owe much of my music sensibility to this gentleman. So much so that I weaved him into a piece I wrote called Remembering Little Walter. He was always a little different in his approach to his instrument than your average musician. 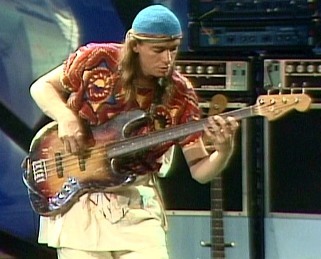 To this day he reminds me of Jaco Pastorius. Not only in his tone, but also the way he’s able to make his bass sing so expressively. His playing is always a focal point on anything he touches; bringing his experience to the forefront on every note for all to enjoy. During those few hours during breakfast we discussed that it was 21 years ago this Sunday that the great Jaco Pastorius passed away. I mentioned that I felt from an influential perspective, Jaco just may be to bass players what Hendrix was to guitarists. The impact Jaco created was truly inspirational and it’s difficult to ignore his influence not only on bass players, but all musicians that were fortunate enough to hear and experience his very special gift. was on born on December 1, 1951 in Norristown, Pennsylvania. Shortly after his birth the Pastorius family moved to Fort Lauderdale Florida. Jaco went to elementary and middle school at St. Clement’s Catholic School in Wilton Manors, and he attended high school at Northeast High in Oakland Park. While growing up, Pastorius loved playing sports and watching basketball with his father. Jaco started his music career by playing the drums; following in his fathers footsteps. A broken wrist while playing football prevented him from drumming. The injury eventually required surgery and Jaco decided that he would fill in the vacant bass player spot in a nine piece band he was in called Las Olas Brass. The band did covers of popular R&B artists such as Aretha Franklin, James Brown and Otis Redding. As Pastorius’ interest in jazz developed, so did his desire to play the double bass; an instrument used not only in jazz settings, but other genres such as 1950s-style blues and rock and roll. After saving up money to buy the instrument, he discovered that it wouldn’t hold up to the Florida humidity. Instead he replaced his bass with a Fender that he pried the frets out of. Jaco then filled the fret holes with wood putty, and coated the fingerboard with marine varnish. Throughout his youth Pastorius continued to develop his skills, honing his songwriting prowess in bands like Wayne Cochran and The C.C. Riders. In 1974, he started to play with his friend and later famous guitarist Pat Metheny. Together they recorded with artists such as Paul Bley. They also made an album together for ECM with drummer Bob Moses entitled Bright Size Life. In the mid seventies, Pastorius met up with drummer Bobby Colomby, who played with Blood Sweat and Tears. Together with Colomby acting as producer, Jaco made his first album the infamous self entitled album entitled Jaco Pastorius in 1976. The album became the talk of the jazz scene and was widely praised by critics. His solo album was also noted for its incredible lineup of serious jazz musicians that included Herbie Hancock, Wayne Shorter, David Sanborn, Lenny White, and Michael Brecker just to name a few. Even R&B singers Sam & Dave would reunite to appear on the track “Come On, Come Over”. It was during the time that Pastorius released his solo album that he ran into keyboardist Joe Zawinul in Miami where Weather Report was playing at the time. Not being shy about his talent, Jaco told Zawinul that he was “the greatest bass player in the world.” And he sarcastically told Zawinul that he thought his band was sort of alright… Sources say that Zawinul initially had a few F sharps for Pastorius, but eventually admired him for his brash demeanor. The two of them would stay in touch and it eventually led to Jaco joining the band during the recording of Weather Report’s Black Market album. Pastorius contribution to the band became a vital part of the group’s makeup. His presence brought Weather Report new fans and enhanced the band’s compositions and their live shows. If people were unaware of Jaco’s talent, the Grammy nominated album Heavy Weather in 1977 would certainly change that. His bass playing on that album was outstanding, and he would also receive a co-producing credit along with Zawinul. Pastorius also returned to his original instrument the drums by playing on the cut Teen Town. During his career, Pastorius played on many recording sessions for other musicians, both in and out of jazz circles. Some of these include, Ian Hunter, David Sanborn, Al Di Meola, Mike Stern and Biréli Lagrène. Out of the many guest appearances by Pastorius, my personal favorites would have to be the some of the work with artist Joni Mitchell. The album Shadows and Light in 1980 had him and friend Pat Metheny joining forces again. The music on this album was beautifully driven with Pastorius’s melodic flair. As the years passed Pastorius started to develop severe mental health issues. Drinking and drug use would only worsen the problem. Diagnosed with a bipolar disorder, he began a path of strange behavior that ultimately affected his life on and off the stage. Slowly he started to become an outcast in the music community as he would be banned from one club to another. Eventually it was this erratic behavior that would take his life as he was involved in a fight with a bouncer after sneaking on stage at a Santana concert. The confrontation would send him into a coma. On September 21st, 1987, he was taken off life support, and at the age of 35, we lost the great innovator. Many artists over the years such as Miles Davis, Marcus Miller, John McLaughlin, Rod Argent, Bela Fleck and countless others have paid tribute on their albums to this legend of the music world. All of these artists work ensures us that his legacy will continue to be honored for a long time to come. 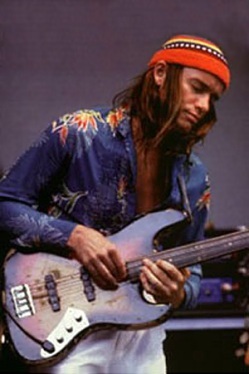 When I think about some of the people that inspired my love for music, I think about the great Jaco Pastorius. It was Jaco that led me to listen more intently to Weather Report and artists such as Joni Mitchell and Pat Metheny. When I worked at the record boutique in my teens; I turned as many people on to Jaco as I could. I would play his music to anyone who was willing to listen. His self entitled first solo album Jaco Pastorius along with Heavy Weather will always be one the most played vinyl jazz albums I still own and will forever cherish; major pieces of inspiration for TheBluesBlogger. As my friend began to drive off, I started to think, it really was him that made me aware of Jaco. It was his playing over the years that opened my ears up to the jazz genre and provided the inspiration and motivation to move to NYC and search for work in a recording studio. Listening would not be enough! I had to be a part of it somehow. My friend allowed me to be a part of his music world, and it helped me to appreciate music generated right from the creative process. Thank you my friend! During the writing of this article, I realize I have left many gaps in the life and career of Jaco Pastorius. There are just too many to fill in just one post. Perhaps that’s where you can help. Please make sure you add your comments below and help fill in some of the details that may be important to you. Did Jaco have any influence on you as a music lover? Or did he inspire you as a musician? Your comments are always appreciated. You have a truly amazing blog! Thank you for sharing. That’s very kind of you to say… It’s truly very appreciated… Thanks again!!! A good blog is one that touches the soul of others. And this one has reminded and touched us with how the gifted and talented are prematurely no longer of this world. Thank you for an excellent thought. Nobody has contributed has much has Jaco to the world of Bass playing and bass players. He is like our Hendrix, weather you like his music or not, he opened up your mind! What an excellent article, I wish I had your writing skills. I’m glad you brought this person to my attention. Thanks. I remember seeing Weather Report in Eugene Oregon way back when It was a stunning concert but the audience was not really understanding the music at all. I guess they were ahead of their time. For those that give Jaco’s musicianship less than it’s due. How often have you heard a dialogue comparing bass players other than Jaco to each other? How often have you heard a dialogue comparing another bassist’s playing to Jaco’s? I’m a pretty good guitar player. When I hear Jaco play, I want to play a fretless bass. I bought one. Wonderful article. Jaco will always be in my prayers, I will never forget him…. Coyote. A totally awesome talent… somehow totally missed this musician when he was alive… only because I wasn’t quite into jazz back then I am sad now to say !! But my 1st impression is he was to the bass guitar what Hendrix was to the 6string… both “true innovators” in their respective genre’s !! All I can really say now is “WOW”… I will be searching for more about this great innovator… hopefully I can find at least 1 of his albums…. or find which ones he has played on !! Thank you Blues Blogger !! Wonderful article. Jaco will always be with us, on my mind . I will never forget him…. I was not familiar with his work, although obviously I listened to him often as part of other groups. Hi, pastorius is great – i still remember his playing with joni mitchell and metheny – “goodbye pork pie hat” is marvelous. I play swinging and blues music on guitar. Incredible what a bass can do. Posting to FB, as usual. We did have an unusual meeting with Jaco once in Denver, my husband and I were waiting to see him and he came running up to us and asked if we’d vouch for him so he could get in the theater! He was pleading with the lady in the ticket booth, “I’m Jaco, I’m Jaco, I’m supposed to play tonight!” She wasn’t taking his word for it or ours. Someone finally came out and got him. Great concert. My heart just breaks every time I think of his death and the more I learn about bipolar disorder, the more it seems like a nutritional balance that the drugs and alcohol could have caused. Jaco actually ended up homeless sleeping in a park in NY with his bass at one point. Just tragic. Someone should do a movie of his life, but nobody can play like he does. Last year I had a very vivid and startling dream of him calling me for help, bloody from being beaten up (how he was killed) so started praying to make sure he knows to go to the light, don’t be afraid, and that his soul is at peace. If you are so inclined, the more prayers the better. Happy Birthday, Jaco. We love you. And I forgot to say that it took us a few moments to recognize him because he had just cut off all his hair and you young people might find it hard to imagine what the music world was like back in the days when there was no internet, radio or tv station around who would play Weather Report or even cell phones to call someone backstage! We were really “underground” which is where that term comes from. Oh yeah, when Joni teamed up with Jaco for Hejira, followed by Don Juan’s Reckless Daughter and Mingus, some people were saying it was too jazzy and far out for them but those were some of my favorite albums of hers. She was pretty mainstream by that time and had fans of all kinds, from top ten pop lovers to people like us who embraced the new direction. We can watch the “Shadows and Light” DVD over and over, one of the best bands ever. Pat Metheny is my husband’s favorite guitar player and Jaco is his favorite bass player. Love Jaco!! I have read the biography 5 times! I can’t wait for the movie to come out! He is the reason I play bass!!! When I think of all the great music he could have made all these years it makes me sad that he died so young…. But his music is timeless I listen to him a lot… He made a lot of great music in the short time he was with us!!! Jaco Pastorius had a big influence on my playing and he made a big impact on my style. It was 20 years ago when I was listening to Jaco, Marcus and Stanley. Nowadays I am rather “funk soul brother” and much more digital, but memories waited behind. I live in Brazil and first time i went to Us, i went to visit the house where Jaco used to live in Dade County., I had to do that before take my kids to Disney. In the mid-80s, I was walking with a friend through Washington Square Park. There was a guy laying in the grass with a boom box playing Weather Report and a bass sitting nearby. I said to my friend that this bum thinks he’s Jaco. I had no idea at the time that Jaco was ill, and it actually WAS my hero. Sad story.